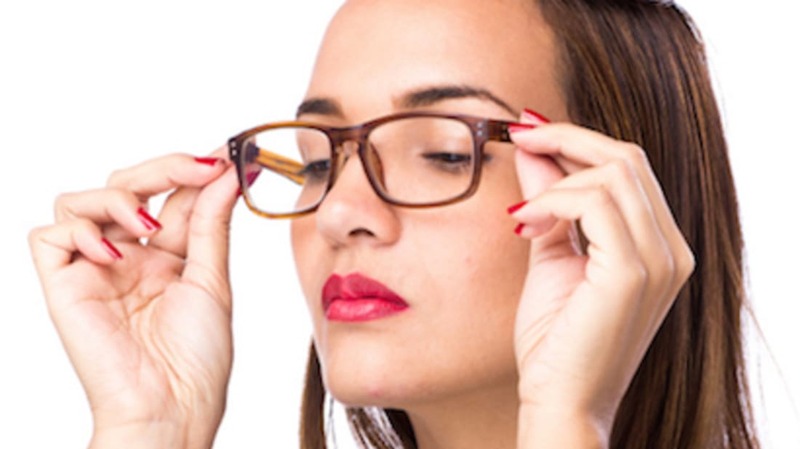 If you wear glasses, you're familiar with the struggle: Heavy frames slide down your nose, lenses smudge your mascara, and at the end of the day you find more foundation on the bridge than on your face. But there is hope! The hive-mind of the Internet has amassed an amazing number of tips and tricks for making sure glasses accentuate your look rather than distract from it. 1. BLOT YOUR FOUNDATION TO KEEP YOUR GLASSES FROM WIPING IT OFF. Too much moisturizer or a watery foundation can have your glasses sliding around your face and picking up makeup that you wanted to stay on your skin. The solution? Cosmopolitan recommends blotting excess foundation on your nose and your cheeks (where your glasses sit) with a damp makeup sponge and adding a dust of setting powder to keep your glasses from sticking. 2. A DAB OF PRIMER ON THE BRIDGE OF YOUR NOSE WILL PREVENT SLIDING. This genius tip comes from the Redditers in the MakeupAddiction subreddit. Putting a tiny amount of eyeshadow primer (not foundation primer) right where your glasses sit can keep them in place all day. 3. COUNTERACT THE BLUE-GREEN SHADOW OF YOUR GLASSES WITH YELLOW UNDER EYE CONCEALER. A concealer with slight yellow undertones can work to hide shadows that make you look like you haven't slept a day in your life. Dab a little in a triangle from the corner of your eyes slightly down your cheek to appear fresh-faced and wide awake. 4. IF YOU'RE TIRED OF LASHES HITTING YOUR GLASSES, FOCUS ON CURL, NOT LENGTH. In her YouTube tutorial, beauty guru Nicole Guerriero advocates for using an eyelash curler twice, once before applying mascara and once after, in order to ensure your lashes go up and not out (towards your glasses.) Since using a curler on lashes sticky with mascara is risky, we recommend curling only before and then using a mascara formula that promises to hold the curled shape. 5. MAKE SURE YOUR MASCARA IS FRESH. Another reason you might be seeing mascara flakes on your glasses? You're using dry, expired makeup. Cosmopolitan vouches for using a creamy, waterproof formula to prevent sticking to your lenses—and then throwing it away after a few months. Mascara should never be used for longer than three months after it's been opened or you'll risk a bacterial infection in addition to flaky lashes. 6. DON'T NEGLECT YOUR BROWS. The gurus in the MakeupAddiction subreddit stressed this point again and again: Just because they're partially hidden by frames doesn't mean you should forget the feature that will really frame your face. Neat, brushed brows that are evenly filled will peek out from behind your glasses and make your entire look more polished. 7. HIDE RED MARKS LEFT ON YOUR NOSE WITH A TINTED MOISTURIZER. Chances are you're planning on taking off your glasses at some point. And when you do, follow Cosmopolitan's advice and make sure you even out any redness or annoying marks left from glasses with a tinted moisturizer, BB cream, or foundation.